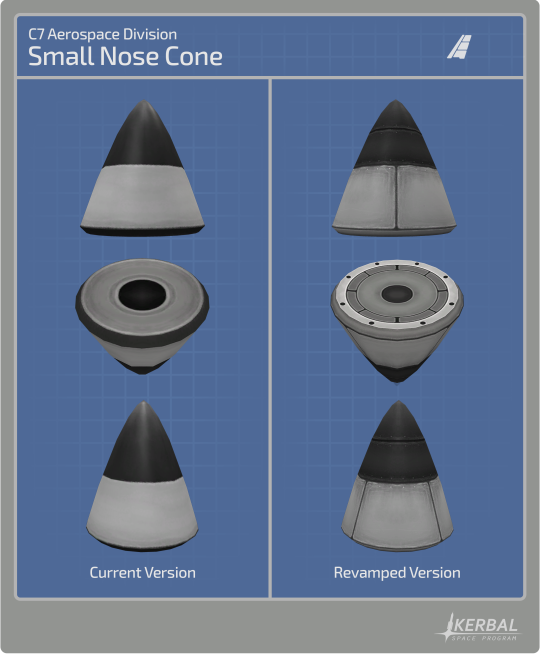 Nose cones have helped your rocket stacks reduce their drag for a long time, but were in need of some well-deserved attention. 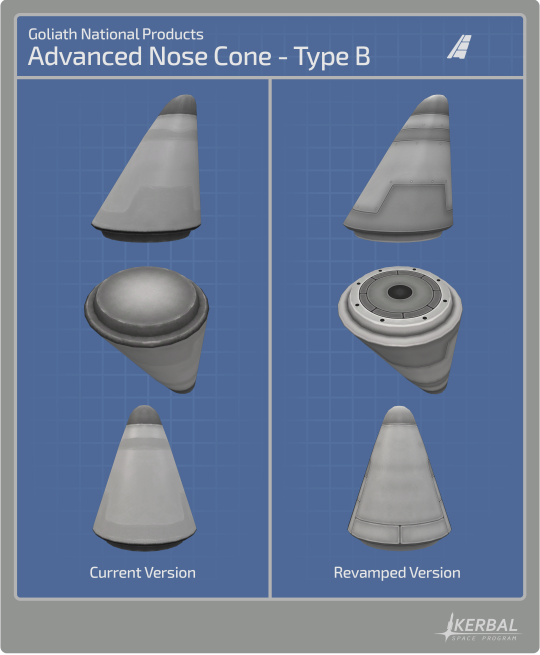 Our artists gave a facelift to the C7 Aerospace Division’s Small Nose Cone and Goliath National Products’ Protective Rocket Nose Cone Mk7, the Aerodynamic Nose Cone and the Advanced Nose Cones - Type A & B. 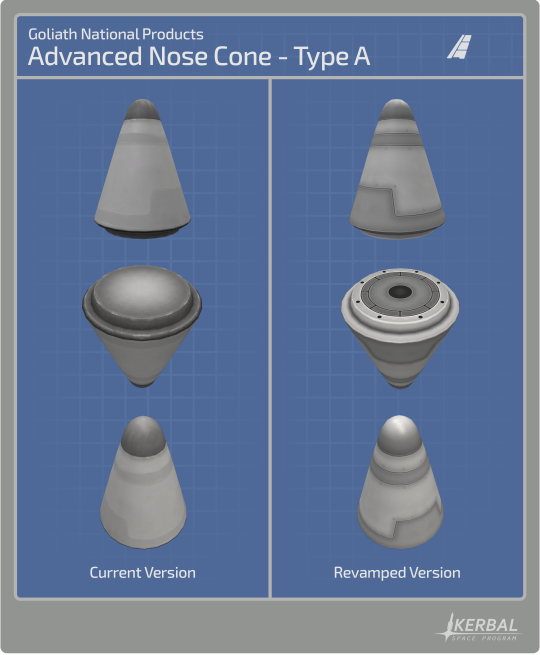 All these nose cones got brand new diffuse and specular texture maps. 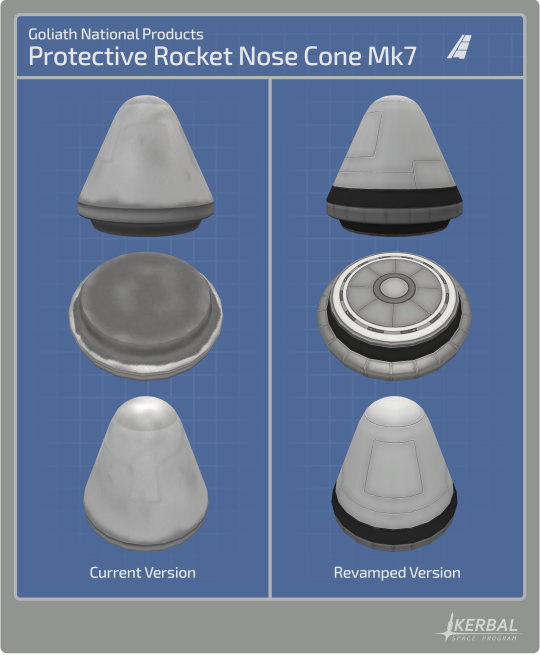 Additionally, the colliders of the Protective Rocket Nose Cone Mk7 were revised and, with the exception of the Small Nose Cone, all have new variants to match with your preferred style. 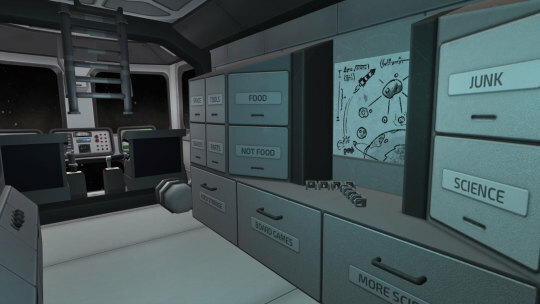 As we disclosed in the last edition of KSP Loading…, we are currently working on a substantial update for KSP on consoles and it will include various items that the PC version currently has. It is important to note that there always will be differences between the PC and console versions. For instance, if we were to bring Update 1.5 to consoles, we would have to do an entirely new port, something that would take a massive amount of time and resources to achieve and would detract from the overall progress of the game. Instead, we are working on a console-optimized update that will take bits and pieces of all updates we have released after 1.2.1; some of the ones that people like the most. 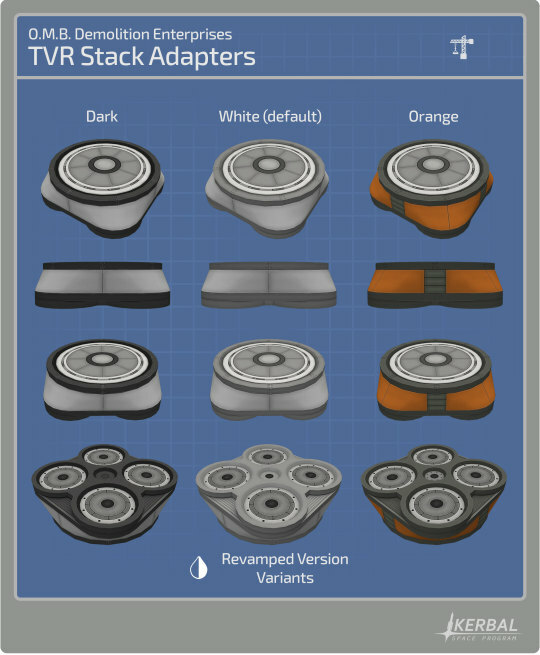 Just to name a couple examples, this next update will include several revamped parts, the variant switcher, and a number of other things that we will be revealing along the way. Hi! 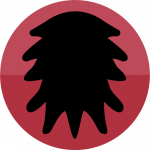 I’ve just joined the team very recently, but I’ve been working on games as a software engineer and designer since 2002. 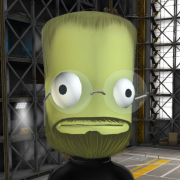 I’m a huge KSP & rocket fan - the realism mods really hooked me. And I’m a general nerd-about-town of the sci-fi/ fantasy/ video game/ boardgame/ tabletop RPG/ wargame/ computer/ physics/ you name it type. I also travel a lot and hang out with my better half and our cats to pretend I’m halfway normal. Good to see that the Terrier is influenced with Porkjet's. 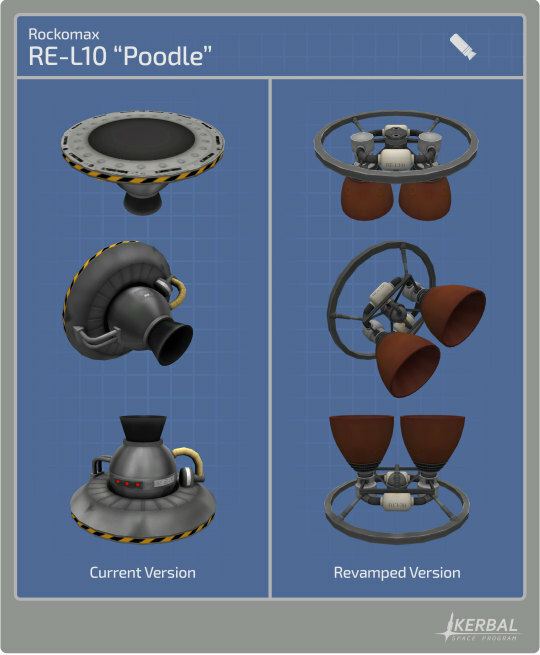 But will be pleased to see an one-nozzled variant of the Poodle and narrow-windowed variant of the Mk2 lander can. The Small Nose Cone and Advanced Nose Cones were fine as they were. 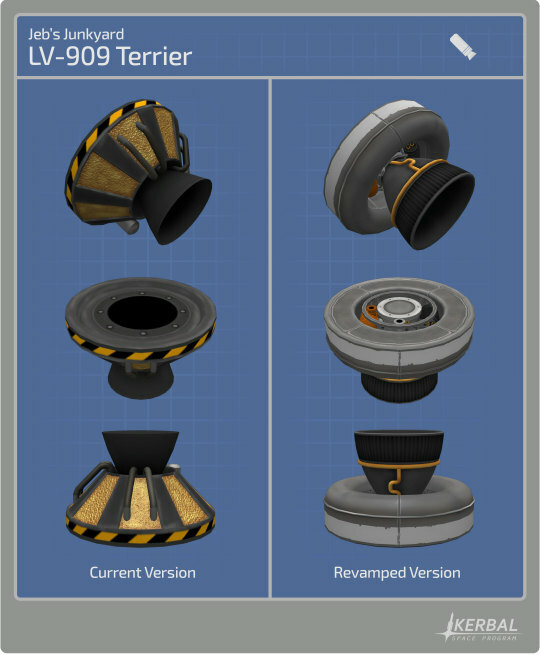 All that was needed for those are more variants for Advanced cones just to match the new texture variants. And classic Aerodynamic Nose Cone and Mk7 Rocket Nose variants - for nostalgia. Oh wow! Does it mean the Wolfhound stops being an imbalanced über-engine? 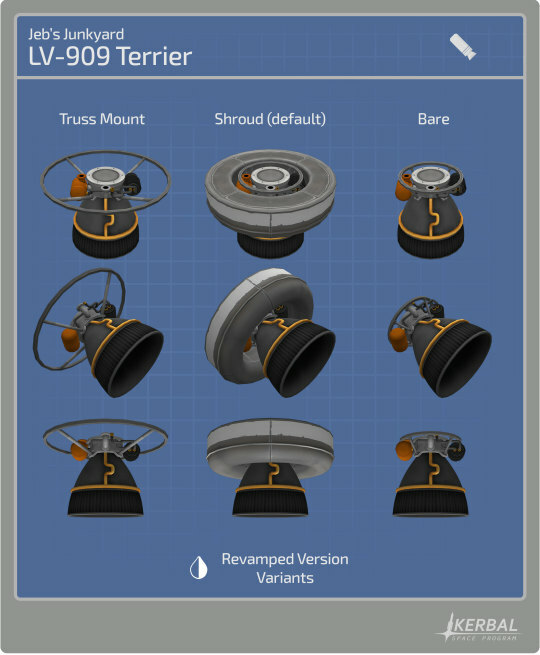 My particular favourites are the Mk2 Lander Can and the Terrier — those are great! The nosecones look sharp too. Hah! You can’t fool us! 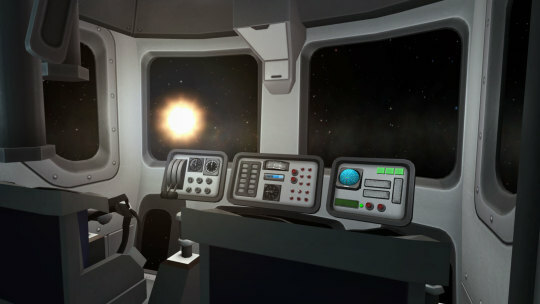 Nice looking update, the dV implementation is pretty slick and the Terrier looks hot! Hopefully “right around the corner” means in time for Christmas holidays. But hey, don’t rush it, I’d rather get a good update later than a buggy update sooner. Ohhhhh I really Like that terrier. One of the better revamps. Finally it's my turn to lament the loss of an old part---the old Terrier's gold foil cone will always be iconic for me. Would love to see a variant inspired by the old style. Makes me wonder if the variant system is able to support different colours and different engine layout variants at the same time. The new feature are really looking nice, and I do look forward to seeing them. But I'm really worried. The bugs in this game are building to a point that it's almost unplayable, at least for me. Game stutter (frozen for 3 - 5 seconds every 20 - 30 seconds), memory leakage, progressive refresh degradation, LT-2 landing leg bugs, Large Landing gear bugs. The 1.5.1 defect list is long and getting difficult to work around. Please take an extra month or so and get the core game working better! Pretty Please!! I will miss the stripes. I was expecting a revamp to hint at those at least. You win some, you lose some. Despite the loss of some of the old Terrier’s character, it’s still a pretty nice-looking engine. Wow, very nice. I like that you managed to retain the gold/black theme a bit. 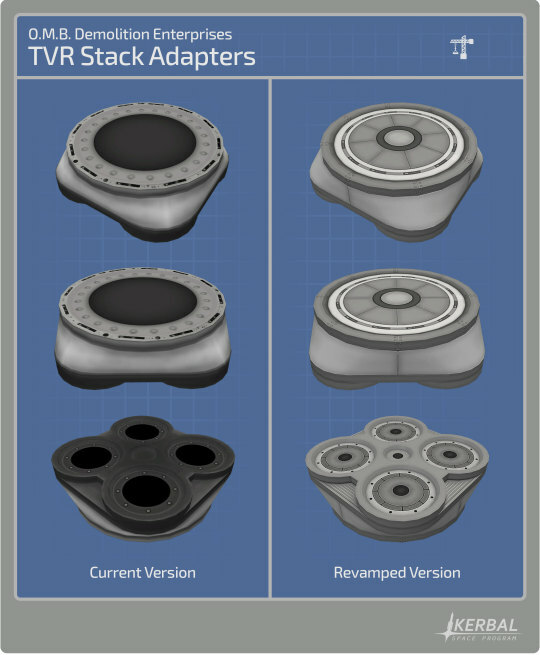 Glad to see the Porkjet-esque part variants as well. I really can't wait to see how this will all look when put together. 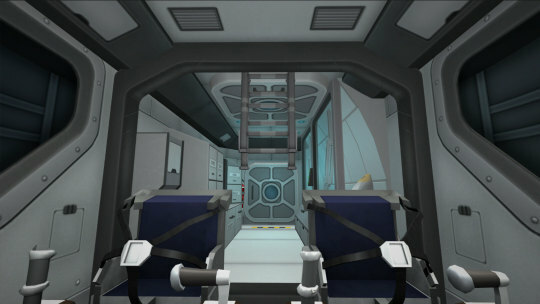 I'm not as into the greebled structural components (adapters & Fuel Tanks) I'm afraid, though they might end up looking fine when everything is complete. Hi Maxsimal! Really nice update, I really like it already. As a part of this update (or the next one or so) will we get a stock "real plume" effect? It looks unnatural that we have the same rocket exhausts in the atmosphere and in space as well. 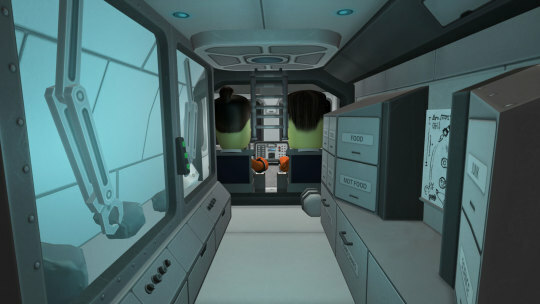 Will you have something for the skybox as well? I also would like to ask, if these revamps will increase the memory/CPU usage, or they will not have a huge impact? Best wishes, and keep up the good work! Love the new designs. The MH engine re-spec is really exciting! @RoverDudeAny chance you can share the new MH engine specs? I like the new engine bell shapes on the vacuum engines. 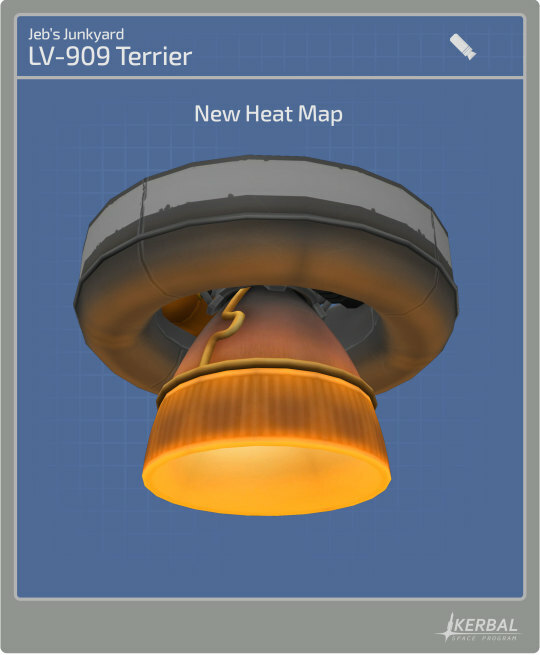 Their shape always bugged me before since real world vacuum engine bells need a "taller shape" than atmo engine bells, and in KSP they were the other way around with the poodle and terrier having shorter fatter nozzle shapes than the skippers, mainsails, swivels, and reliants. I also get why the poodle was changed to two nozzles - because that's really the only way to make the nozzle have the right shape while still keeping the overall part height similar to what it was before - by making the nozzle smaller overall, which then means you need more than1 of them to make it look believably powerful enough. Digging the new look, even if it means having to learn what everything looks like in the parts panel all over again. 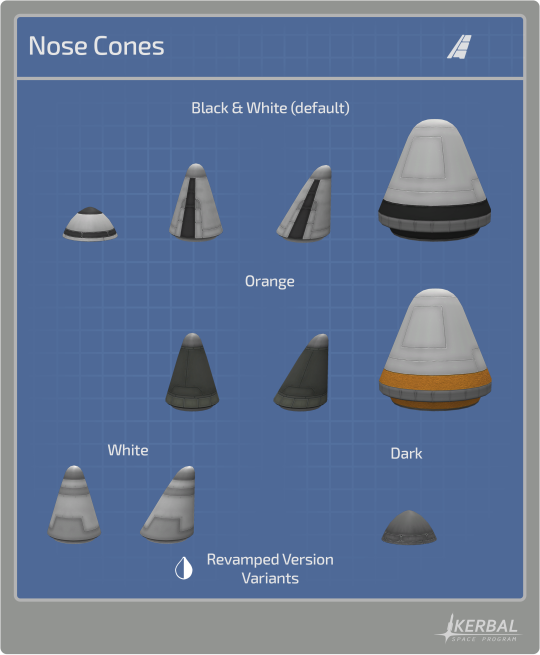 Is there any chance that a future update will ditch the per-part texture variations and go to a universal coloring scheme? Instead of finding out that, dang it, the Titan/Arianne/whatever texture just isn't available for a particular part can we go to a system where the player can pick a main color and accent color for each part? It'd make it *so* much easier to create visually distinct vehicles. Finally it's my turn to lament the loss of an old part---the old Terrier's gold foil﻿ cone will always be iconic for me. Would love to see a variant inspired by the old style. The orange-and-black palette keeps continuity, to some extent. The shrouded version could definitely inherit more of it, though. With the upcoming 1.6 update we are adding Dynamic Cube Maps to flight mode. so metallic parts, such as the Probodobodyne Stayputnik will now also reflect the surrounding environment on their surface. Delta V? TWR? Helmet removal? Nah! Can do it myself! at least the first two. This makes me really excited for this release! 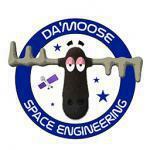 Why did you have to change the advanced nose cones and the small nose cone? In my opinion, the old versions were actually better. More stutter for the stutter god! Can be turned on/off. Up to you to use it.